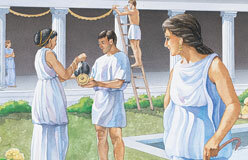 August 24, A.D. 79, started out like any other summer day in Pompeii, a town in southern Italy. The sun shone brilliantly. 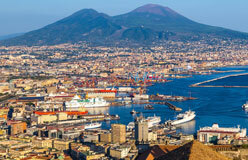 The Bay of Naples was calm. Sheep grazed on the side of nearby Mount Vesuvius (Vuh-soo-vee-uhs). 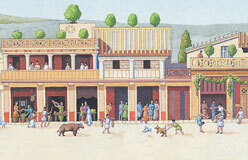 Farmers, fishermen, potters, weavers, and bakers brought their goods to the marketplace to sell. By late morning, the town was humming. Some people were shopping, others attended a town meeting, and children played outside. Suddenly, a deafening crash broke the midday calm, and the ground shook violently. 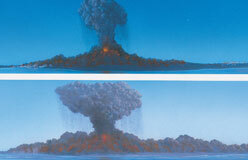 Some looked at Vesuvius and saw smoke rising from its top. Within hours, Pompeii was buried under six to twenty feet of ash and pumice, a spongy rock. Two thousand people died, and a whole town was gone. And the cause of all this destruction? 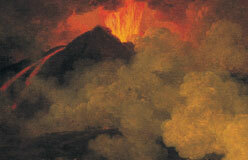 It was the volcanic eruption of Mount Vesuvius. 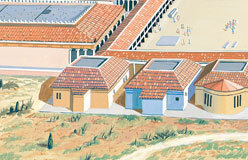 Pompeii remained buried for nearly 2,000 years. Even so, the legend of a lost city was passed down from generation to generation. By March 23, 1748, researchers had made several important discoveries in the area. But on that day, diggers began to uncover the buried town. 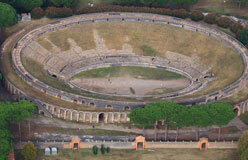 Read on to find out more about Pompeii, the city that time has not forgotten.